If you’ve ever had to hire a new employee, then you know how taxing and tedious it can be. Perhaps the most time-consuming part of the process is sifting through the mound of resumes you have in your inbox and deciding which candidates are the most qualified for this specific position. Contacting them and phone screening them takes up another chunk of your time- and this is all before you carve out areas of your work day to fit in interviews with the most qualified candidates. Are you exhausted yet? Thankfully, there is a better way to hire and to find the best candidate for your job. By incorporating video technology and video interviews into your hiring process, you can shave off hours of time. In fact, that’s exactly what pre-recorded video interviews are designed to do. Not sure video interviews are for you? Take a look at these four advantages that one way video interviews offer to hiring managers and start streamlining your hiring process today. Time is money, and your time is valuable. It’s quite shocking to learn that on average it takes about 45 days to hire a new employee. That’s over a month! When you have your own important work to tend to everyday, it’s more than a pain in the neck to have to take part in a hiring process that takes that long. If you hire the traditional way, then you sift through resumes and pinpoint the candidates with the best skills and the best qualifications. Before you invite them to come into your office for an interview though, you will likely give them a call and screen them over the phone first to test them out. These phone screens take about 30 minutes on average per candidate. On top of that, sometimes you know the candidate isn’t going to work within the first couple minutes but continue with the call anyways out of courtesy. When time is money, you can’t afford to waste it. Switch up the equation and incorporate one way or asynchronous video interviews into the process instead of phone screens. You can conduct 10 one way video screens in the time it takes to complete one phone screen. See how much time you can save with that? People are busy every day. Of course, candidates that are out of work are likely going to be available to talk whenever, but passive job seekers (job seekers that are currently employed) will experience more difficulty carving out a time to speak with you on the phone during normal office hours. When you add your busy schedule to the mix, planning a phone interview or screen can be extremely hectic and stressful. “Noon doesn’t work for me, but 2 p.m. does.” Unfortunately, you have a meeting at 2 p.m. so you’ll have to wait until tomorrow. Sound familiar? 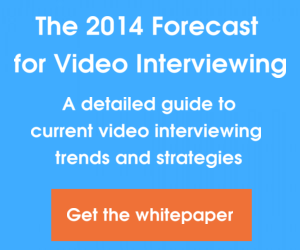 Well, with one way video interviews, scheduling conflicts are obsolete. That’s because you, the employer, send your candidates a set of interview questions that you would like answered such as “tell me about a time you made your deadline during an extremely hectic week.” This gives you an idea of their skills and how they handled situations in the past. Once you send along your questions, the candidate has a set amount of time to get their answers to you. If they don’t make the deadline, they don’t make the cut. No scheduling conflicts and no mess. Just simple, easy screening. 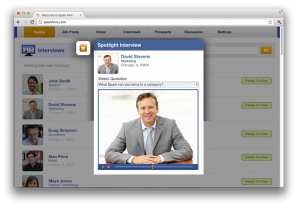 Since we’re on the topic of questions, one way video interviews makes comparing candidates much easier. Since you are able to send your candidates a set of questions, the best thing is to send all of your candidates the same set of questions. That way, you can compare and contrast their answers to see which candidates are more qualified and best suited to fill this position. If they don’t give you the answers you are looking for, then you can easily weed them out. On a phone interview, it’s much more difficult to remember what this candidate said in comparison to what that candidate said. 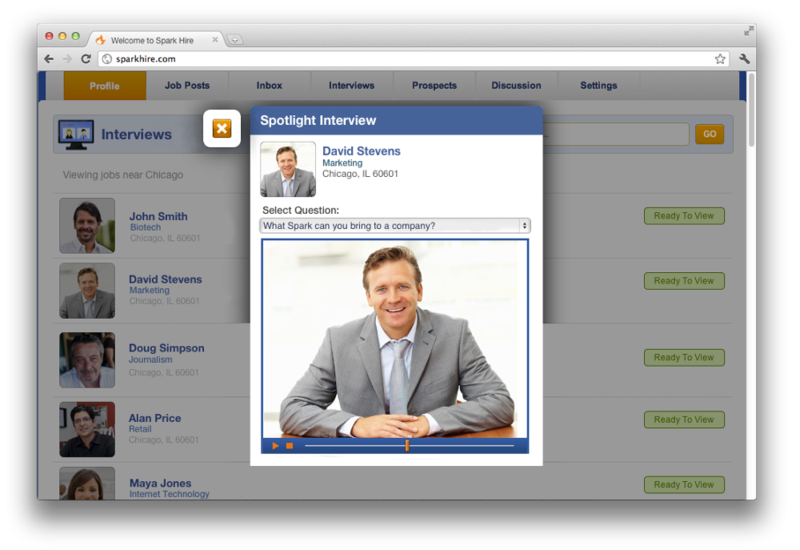 With one way video interviews, you can easily compare answers and revisit them whenever you’d like. You can’t recreate a phone conversation though, now can you? One of the best advantages to one way video interviews is that you can share your candidate’s video answers with others. If you would like a coworker’s opinion on a candidate’s answer, you can easily bring it up and present their video answer to them. You can’t do this with a phone conversation; unless, of course you record it. With one way video interviews, you can gain insight and opinions from your coworkers and you can share them at any time. This makes the hiring process richer and chances are you will hire a much better candidate because of it. If these four advantages haven’t convinced you yet, and you would rather stick the time-consuming, more traditional way of hiring, then more power to you! However, if you are ready to start hiring better, smarter and faster, then get on board with this new wave of interviewing and start making one way video interviews part of your everyday screening process.